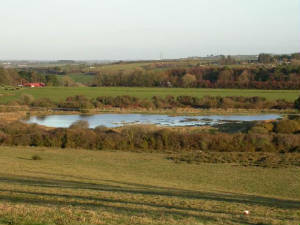 Habitat: Natural lake, with areas of marsh; coniferous woodland along margins. Main interest: Waterfowl; passage waders if water-levels low in autumn. 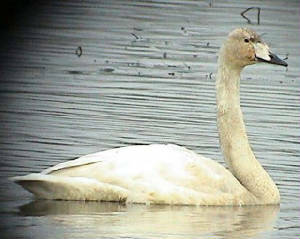 Regular/annual: Whooper Swan, diving and dabbbling ducks. Scarcer species & rarities: Red-necked Grebe, Green-winged Teal (1982), Gadwall, Smew (1987), Ruddy Duck (1982), Pectoral Sandpiper (1984 & 2004), Baird's Sandpiper (1984), Ruff, Green Sandpiper, Firecrest (1980/81). 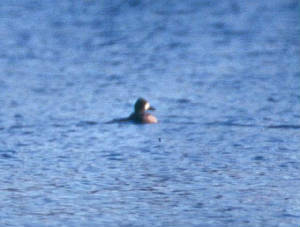 Highlights: Lesser Scaup (Nov 1999) - originally seen at Ballyshunnock Reservoir. Access: When approaching from Waterford, turn left and down the hill at the Sweep petrol station, about 10 km out on the main Waterford-Cork road at Adamstown. At the end of the hill turn off right (instead of continuing on for Kill and Bunmahon) and on up that hill. At the top, veer left (signposted for Knockaderry Reservoir) and continue for 1.4 km. Go right here (signposted "Knockaderry Fishery") and down to the lake. This is the most direct route. Alternatively, from Ballyshunnock Reservoir, turn left at Carroll’s Cross on the main Waterford-Dungarvan road and then right a few metres further on. Continue for exactly 3.5 km and take a sharp left at this (veer right for Kill/Ballinlough). Follow this narrow twisting road, uphill and downhill, for 4.8 km, then turn right and 1.3 km further on (overlooking the lakes) turn left down to lake. 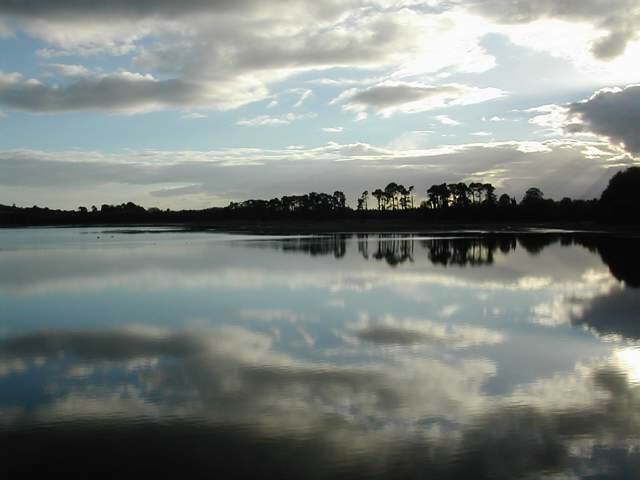 Knockaderry is a natural lake, but it has supplied water to Waterford city since 1887. There is also trout fishing (from boats) here. Access is restricted but there is usually little need to walk around either lake as birdwatching can be done from the road (though a telescope is useful). The reservoir is slightly more awkward to get to than Ballyshunnock, but is well worth a visit. 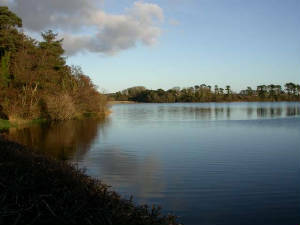 A similar range of waterfowl species to Ballyshunnock is present in winter, and some species are most easily seen in the sheltered backwater at the west side of the lake, viewable from the road. In the late 1980s, this small lake, separated from the main lake by a roadway, became densely vegetated, particularly in summer. Whooper Swan, Wigeon, and Teal numbers can be higher here than on the other lakes, reflecting the prolific aquatic plant growth. Diving ducks (Pochard and Tufted Duck) feed mainly on the large lake, and often a few Goldeneye. Odd visitors have included Red-necked Grebe, Smew, Green-winged Teal and Ruddy Duck. 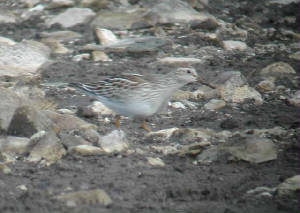 Fewer wintering waders occur than at Ballyshunnock, but there have been January records of Woodcock and Green Sandpiper, with occasional autumn records of Green and Common Sandpipers, Ruff and Greenshank. In some years, water levels have fallen sufficiently to expose large areas of mud by the autumn - in such conditions, Baird’s Sandpiper and two Pectoral Sandpipers were found in September 1984, and another Pectoral Sandpiper in October 2004. Breeding species at Knockaderry include Little Grebe, Mute Swan and Mallard; Tufted Duck has bred in the past. Dippers and Grey Wagtails nest at the outflow stream at the north-east side of the lake and can sometimes be seen from the roadside. In the tall conifers by the lake, Long-eared Owls have bred. Good numbers of warblers also breed, and Chiffchaffs occasionally overwinter. A Firecrest apparently over-wintered from at least December to March of 1980/81.